Washington, DC – A new report from the Environmental Investigation Agency (EIA) – Toxic Trade: Forest Crime in Gabon and the Republic of Congo and the Contamination of the US Market – documents how illegally extracted African timber emerges as "eco-friendly"-marketed products in America, deceiving unsuspecting US consumers. 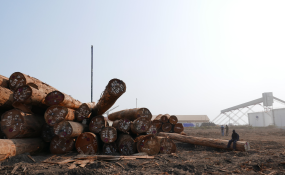 During a 4-year undercover investigation, EIA uncovered the inner workings of one of Africa's most influential timber conglomerates – the "Dejia Group" – controlled by Chinese mogul Xu Gong De. The report exposes a multitude of crimes committed in the forests of the Congo Basin, and the network of corrupt officials who enable illegalities and criminal activity. To make this corrupt business model work and ensure ongoing impunity, the Group relies on well-placed political connections, such as Mr. Jean Ping, who helped Dejia establish its strong foothold in the region, and, in turn, allegedly had his Gabon presidential bid significantly funded by Dejia affiliates; and also bribes, often to high-level government officials. One of the directors of a Dejia Group affiliate in the Republic of Congo told EIA investigators that a "suitcase full of cash" sent to the former Congolese minister of Forest Economy, Mr. Henry Djombo, ensured they would face no obstacles. "Gabon recently has begun to crack down on illegal actors, but much remains to be done. We urge the Republic of Congo to also hold these companies accountable; and both countries to tackle the endemic corruption that undermines domestic industry development and enables rampant destruction of their forests," said Lisa Handy, Director of EIA's Forest Campaign. At least one client of the Dejia Group in the US, Evergreen Hardwood Inc., has helped insert the illegal timber into the US supply chain. Evergreen representative Mr. Jim Green explained to EIA undercover investigators: "Everyone needs to be greased to make things work. I don't care, I understand that. That's how it works. I do that. I do that from here." Green also said, "I'm not worried that you're stealing from a national park. I don't care. I just need to have documentation in case somebody accuses me and wants to look." Evergreen has imported thousands of tons of Dejia Group's timber products for more than 10 years, reselling to major US manufacturers, including the Oregon-based company Roseburg. Dozens of family-owned lumberyards and hardware chains such as Menards and Home Depot have sold Roseburg's products containing this African timber. "The Dejia-Evergreen case demonstrates the need for US authorities to routinely check due diligence systems, and to vigorously enforce the Lacey Act," Handy stated. "Otherwise, illegal timber will continue to flow into the US, and American consumers will remain unwitting supporters of devastating forest crime." Report, executive summary and videos are available here . Copyright © 2019 Environmental Investigation Agency. All rights reserved. Distributed by AllAfrica Global Media (allAfrica.com). To contact the copyright holder directly for corrections — or for permission to republish or make other authorized use of this material, click here.